9 weeks along with the twins. This is our 4th & 5th child. We were shocked to see two, as we have an 8 month old at home that we wanted to have a playmate, now he is going to have two! 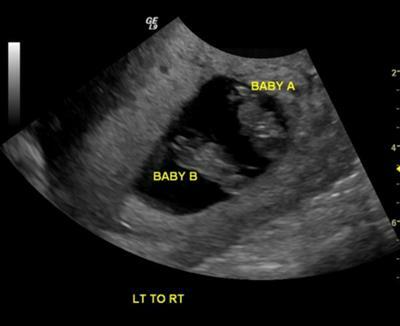 My husband and I just had our first ultrasound yesterday and found out we are having twins! Two sacs and 2 embryos and most important- 2 beating hearts! This is our first pregnancy so we are very excited! I wanted to respond because good friends of ours also had an 8 month old when they found out they were expecting twins! Congratulations and I hope all goes well with everything for you and your family!